Peruvian rotisserie chicken…there are few things in life more glorious. 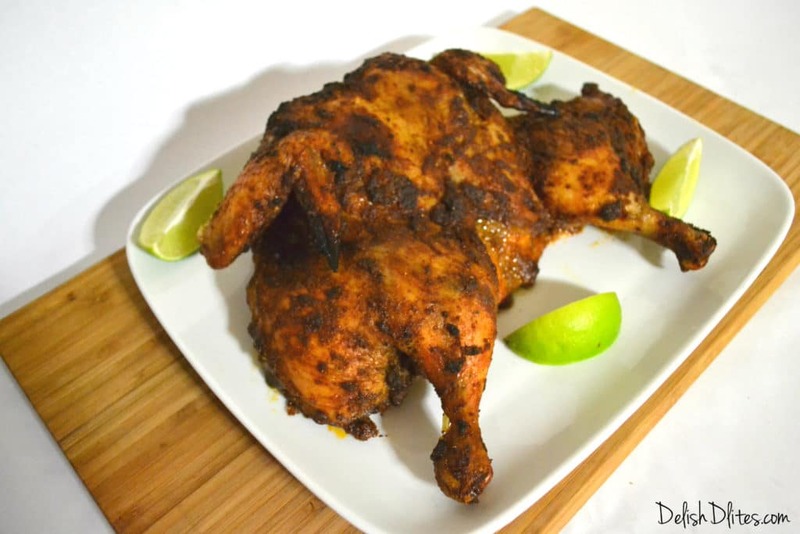 This tender, juicy chicken is rubbed with a delicious adobe colored marinade jam-packed with smoky cumin and earthy paprika before roasting in the oven. Vinegar and white wine add a bit of tang to the marinade, and imparts a one of a kind flavor to this chicken. The traditional method for cooking the bird is over a coal-fired, but you can create this delicious dish at home, without the use of a rotisserie. All you need a spatchcocked chicken (flattened, back bone removed), a baking rack and a baking sheet. With a few simple tricks, you’ll be well on your way to a heavenly meal with a delish Peruvian twist. 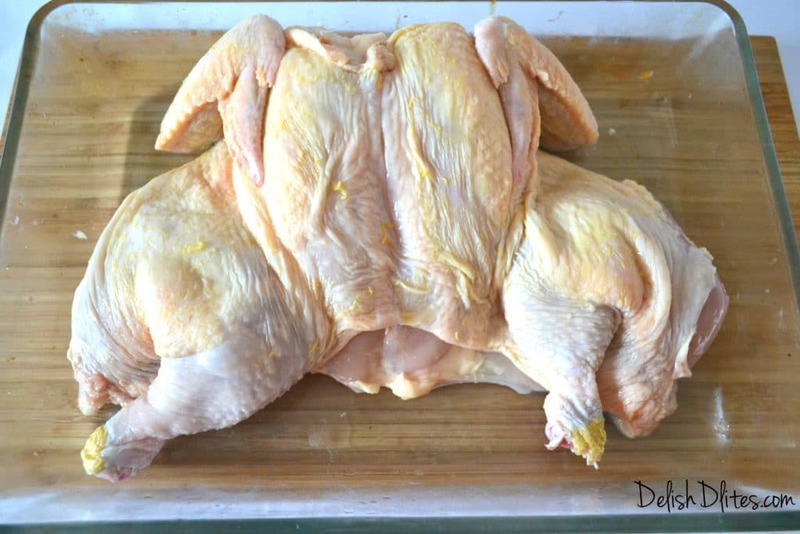 Remove the backbone of the chicken using a sharp knife or kitchen shears, or have your butcher do it for you. Here’s a great guide from Martha Stewart on how to spatchcock a chicken. 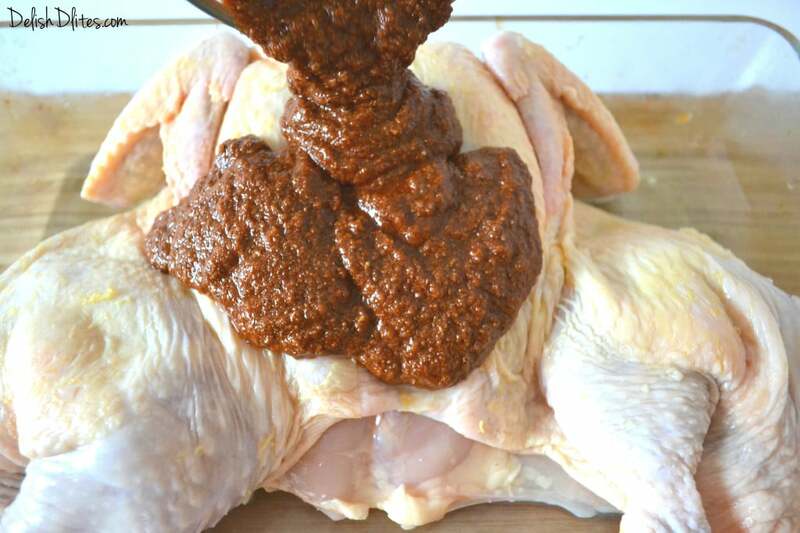 Lay the flattened chicken in a non-reactive glass container. 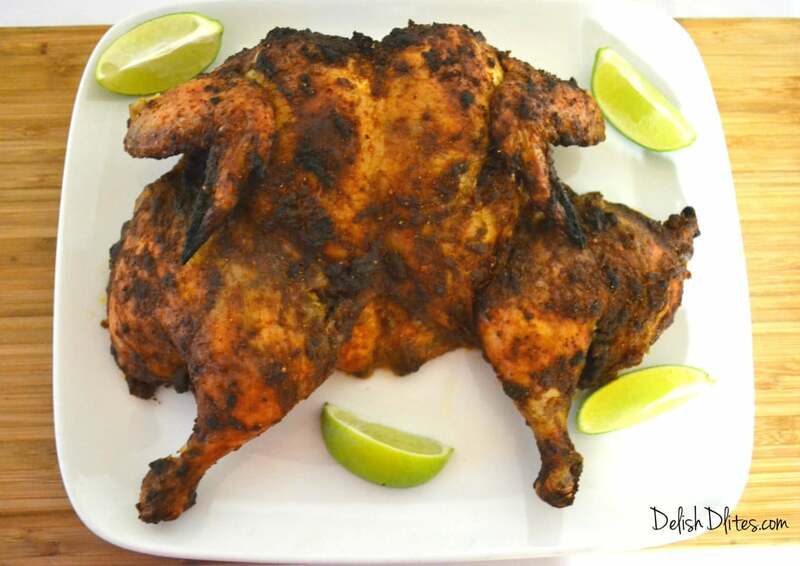 Squeeze the lime juice all over the chicken. Combine the vinegar, white wine, oil and spices, and pour the mixture over the chicken. Make sure to tuck as much of the marinade as you can underneath the skin. Rub it all over, on both sides. Cover the chicken with plastic wrap, then marinate for 4-24 hours in the refrigerator. When you’re ready to cook to the chicken, preheat your oven to 375 degrees Fahrenheit. Place the chicken on a baking sheet that’s lined with a baking pan. This will keep the chicken from sitting in it’s own juices, and will promote browning and crispy skin. 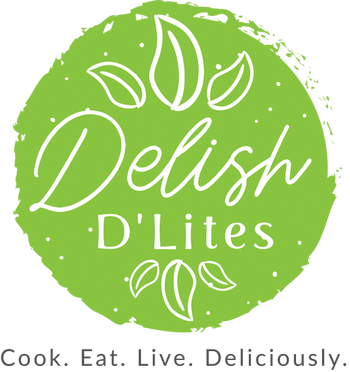 Roast the chicken for 1 hour, or until an instant-read thermometer inserted into the thickest part of the breast registers 160°F and the thigh registers 170°F. The juices will run clear when the chicken is done. Let the chicken rest for 10-15 minutes before carving. Remove the backbone of the chicken using a sharp knife or kitchen shears, or have your butcher do it for you. 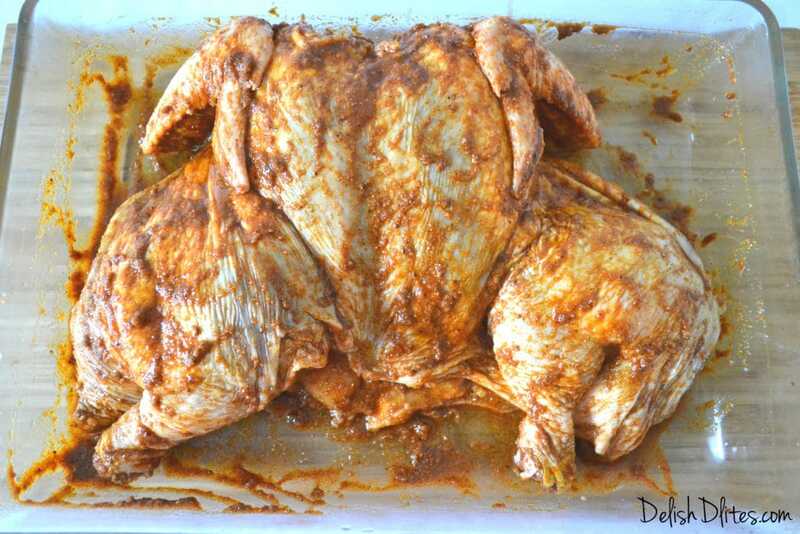 5.Cover the chicken with plastic wrap, then marinate for 4-24 hours in the refrigerator. When you're ready to cook to the chicken, preheat your oven to 375 degrees Fahrenheit. Place the chicken on a baking sheet that's lined with a baking pan. This will keep the chicken from sitting in it's own juices, and will promote browning and crispy skin. 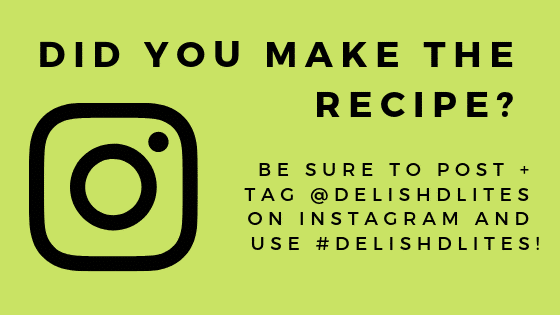 Roast the chicken for 1 hour, or an instant-read thermometer inserted into the thickest part of the breast registers 160°F and the thigh registers 170°F. The juices will run clear when the chicken is done.